Apartment shopping can be overwhelming. There are many things to consider during a thirty-minute tour of an apartment community. You’re deciding on a place to spend your personal life for the next 6-9 months or year, depending on your lease terms. There are so many details on which to focus your attention, you may end up overlooking factors that can make or break your comfort for the duration of your lease. 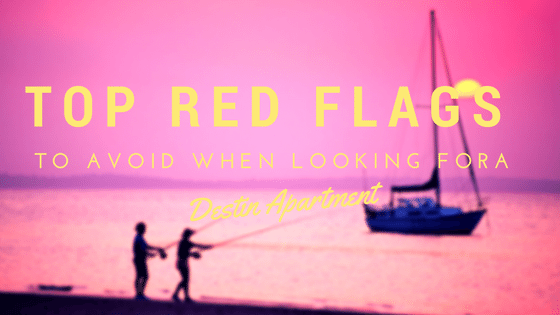 We’ve put together some red flags that may serve as a warning to you as you shop for your Destin apartment. As you pull into the front drive of the apartment complex, take a good look around. Is the front entrance brightly lit and freshly painted? Are the flower beds tended to, properly weeded, and fresh flowers planted? Take notice of the condition of the mailboxes. Are they clean, tidy, and freshly painted? If there’s paper flying everywhere, old signs hanging, and they’re generally run down looking, this complex might have issues with their maintenance team. Check out the parking lot lights. Are they in good and operating condition? Pay attention to the parking lot. Are all the cars in good repair? If you see cars on blocks, hoods up, flat tires, etc., you should take heed. Most property management companies have strict rules regarding the conditions of personal vehicles being stored on their property. If a complex is overrun by cars in disrepair, the property management team may be slacking a bit. As you get out of your vehicle and start walking around, take notice of garbage bins around the property. Are they being used and emptied regularly? If you notice several bins are overflowing, or trash is stacked up in front of dumpsters, these are good warning signs that both management and maintenance aren’t doing a very good job taking care of the property. If the complex has a swimming pool, take a walk around the pool area. Are the patio tables and chairs in good condition? Watch for grass growing through cracks in the concrete. Take a good long look at the pool itself. Is the water clear and obviously properly maintained? Are there life vests hanging nearby? These items are usually required in swimming pool areas provided by commercial businesses. Before you enter the leasing office, look around and assess the whole picture. Do the apartments have window air conditioner units or windows blacked out by aluminum foil? This is usually a huge warning sign that the HVAC units are doing inadequate jobs for the apartment homes. When you enter the leasing office, you should feel welcomed. The staff should be pleased to see you and more than willing to stop their current task to assist you. If you’re treated like you’re inconveniencing them now, how poorly will they treat you once you’re locked into your lease? The guests and residents should always be their top priority. You’ve heard it before: “Location, Location, Location!” There’s a very good reason this advice is often heard. When it comes to your apartment, the location of the apartment community and your individual apartment could be quintessential. You don’t want to end up in an apartment community that gets you stuck right in the middle of beach traffic every weekend, Spring Break, or Summer. Having to plan your commute to work around beach traffic could result in you leaving your home long before your shift and sitting in gridlocked cars for lengthy hours. Another location issue to consider: If you’re a light sleeper, you probably don’t want to choose an apartment community located near an airport or manufacturing facilities. As for the location of your individual apartment, if you’re heavy-footed, you should probably aim to move into a downstairs apartment. That light sleeper may want to choose an upstairs apartment to avoid being woken by upstairs neighbors. Once you find an apartment community with a friendly and helpful staff, beautiful landscaping and well-kept grounds, and a great location, NAB IT! The staff has proven their dedication and commitment to providing a beautiful and maintained apartment community. They’re sure to take care of you and your apartment!